Directions: From Denver, take I-70 west to Hwy 58 west to 93 north. Turn left (west) on Golden Gate Canyon Road. Head up the canyon and make a right onto Crawford Gulch Road. Look for the signs pointing to the park and make a right onto Belcher Hill Road. Take this road into the park and to the main parking area at the end of the road or if that is full, park at the 1st parking area, near the Belcher Hill Trailhead. 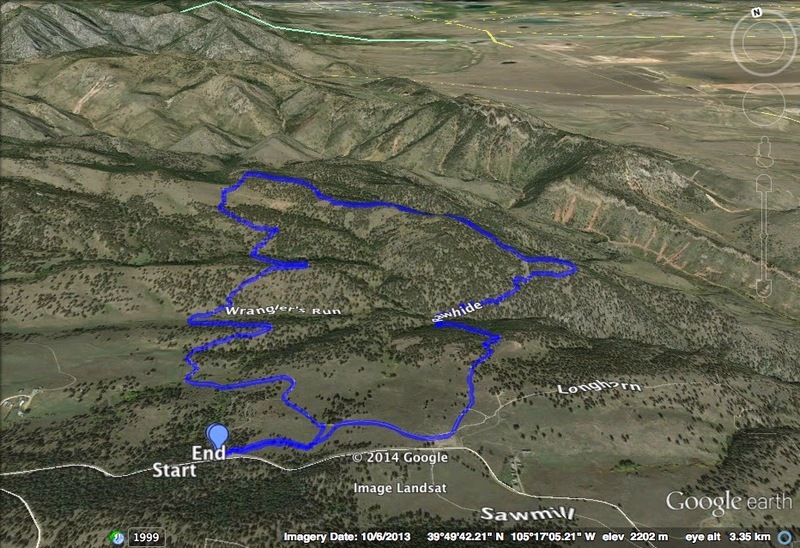 The total Rawhide Trail is just over 5 miles, but there are two ways to make this a shorter loop, the Wrangler's Run Trail and the Waterhole Trail. If you hike the entire trail without the shortcuts, you'll be rewarded with a grand tour of the park. The trail weaves through meadows and evergreen forest with terrific views to the east of the front range hogback and the eastern plains. A particularly nice section of trail can be found just past the junction with the Waterhole trail. The trail takes you to a beautiful open meadow with a rare western viewpoint...in winter this section is a real treat and a great destination. The eastern portion of the trail which is the way back to the parking area, rolls up and down through forests with eastern views until you finally pop out back at the central meadow near the parking lot.